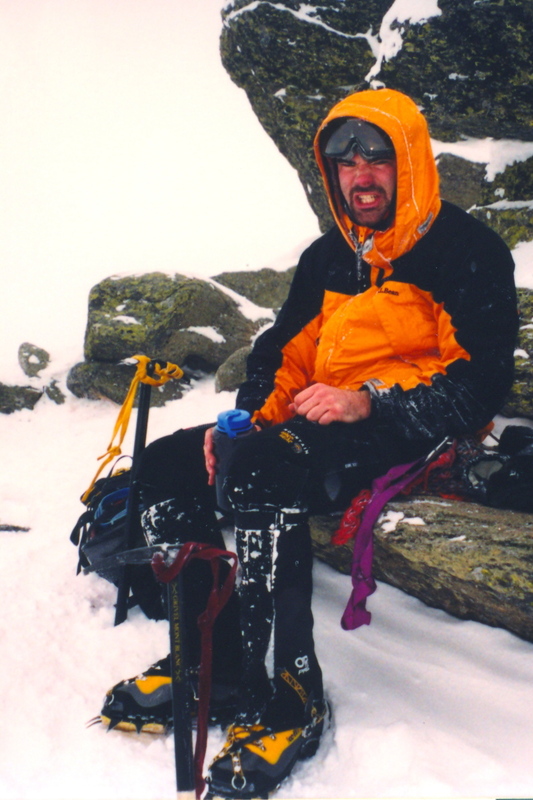 President's Day weekend of 2001, long time friend and climbing partner Scott Fisher and I were climbing the various ice gullies on New Hampshire’s Mt. Washington, one of our favorite winter playgrounds. Though dwarfed by most west coast peaks, the relatively diminutive Mt. Washington is still a formidable opponent not to be underestimated. Standing a mere 6,288 ft, what Mt. Washington lacks for in impressive height, it more than compensates for in famously dangerous and erratic weather. The summit holds the world record for the highest wind gust measured at the Earth's surface, 231 mph. Freak storms can instantly transform any day on the mountain from a peaceful climb into a full blown survival scenario. Smart climbers know to keep a watchful eye not only on where they place their feet but also on the sky monitoring the fickle meteorological conditions. Despite knowledge and preparation even the best and the brightest climbers occasionally stumble, leading to tragedy on a mountain that allows little error. Stories echo out of Tuckerman and Huntington ravines, telling the sad tales of hikers, climbers and mountaineers who have succumb to its wrath. Being young, determined and a bit fool hardy, when we first started climbing in the Presidential Range of the White Mountains we thought little of the dangers associated with a winter ascent of the highest peak in the Northeastern United States. In those days, we were knowledgeable enough, seemed to operate within the limits of our skills and were always watchful of impending danger. Our favorite weekend excursions, involved breaking out of work early, packing the truck with our gear, racing out of Machias, Maine and attempting to cross the typically snow and ice covered route two to Pinkham Notch in one piece. Usually this drive was uneventful but occasionally our evening jaunts are fraught with blizzard laden terror. Upon arriving at Pinkham we would spend the night in the back of my old pickup truck, comfortably tucked into our -20 mountaineering bags despite the nighttime air temperature that was rarely above zero degrees Fahrenheit. The next morning would be spent enjoying a hearty breakfast at the Pinkham Notch Visitors Center (one of our few weekend indulgences), conducting a final gear check and then we were off for a day of climbing, in either Huntington or Tuckerman ravine. On rare occasions, like the long MLK weekend of 2001 we would climb for two days, on the harsh slopes of the mountain, retiring each evening to the simple yet comfortable Harvard Cabin. Harvard cabin was originally built in 1963 and since that time has been lovingly maintained and administered by the Harvard Mountaineering Club. Under a special use permit with the US Forest Service, the cabin is open throughout the height of the winter climbing season from December first to the end of March. The cabin is a favorite of winter climbers and a historical spot not to be missed on any trip into Huntington ravine. Though many will stop by the cabin and admire its rugged beauty, few will ultimately see the cabin in all its glory, when it is filled in the evenings with its typical melting pot of hikers and climbers. Evenings are often rowdy affairs, filled with climbing stories, card games, sung songs and even the occasional reading of a manly poem. Upon the kindling of the fire, the building warmth brings new life to the cabin’s rabble and the evening ignites with assorted tales of days lived gloriously in the mountains. On every clothesline, rafter and exposed nail head is parked a wet piece of winter clothing, slowly being dried by the over worked wood stove. All of the best spots, near the stove, have been taken and late arrivals will likely have to suffer through the next day with damp socks and mittens. Pots rattle and pans crash as individuals attempt to rally for cooking positions, around the cabins small gas powered range. A five gallon bucket and small hatchet rest beside the stove and serve as a means of collecting cooking and drinking water from a small stream in back of the cabin. Nobody is ever picked for this or any of the other cabin task; rather individuals freely help whenever and wherever they can stacking firewood, shoveling walkways, sweeping the floor, etc. There is a distinct smell in the air that is best described as a mix of cuscus and wet dog. The management of the cabin and all of its various patrons is assigned to a caretaker. This individual is responsible for collecting the usage fees, assisting overnight visitors and providing climbers with critical weather and avalanche danger updates. On our particular visit, this task was assigned to a man named Ned Green. 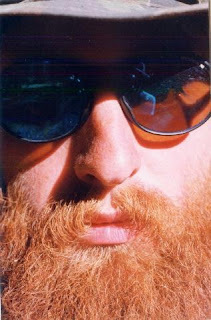 Ned fit all of the qualifications you would expect to see in a cabin keeper, a deeply gregarious soul, a hearty love for the mountains and his fellow man, he was an instant hit among the various “guests”. With Ned and I both possessing a healthy affection for tall tales and hard alcohol, it wasn’t long before we were both sitting at the cabin’s picnic table, swapping stories, photos and the occasional shot of Jagermeister. I believe Ned and I were the only ones in the cabin that evening "man" enough to drink the foul tasting substance. Ned was pleased to hear I was from Maine and had also completed multiple winter ascents of the rugged Mt. Katadin. He shared that he had recently climbed Katahdin and it was apparent from his enthusiasm that he shared my love of this remote and challenging peak. Retreating to his loft “apartment”, he soon returned with a number of photos documenting his trip into Baxter State Park, climbing some of the areas more formidable rock formations. Though his accomplishments on the mountain were vastly more difficult than anything I hoped to ever accomplish, he was not one prone to bragging but rather content to tell a good tale by simply stating the facts. By the end of the evening, half a bottle of Jagermeister had been consumed and I had made a new friend. As our time for sleep approached, Ned inquired as to what Scott and I had for climbing plans the next day. After sharing our plan to climb central gully, Ned invited us to instead follow him up one of Hunting Ravine’s more demanding ice climbing routes, a near vertical ice gully named Damnation. Ned also stated he planned to accomplish the task unroped or without the use of any protection to guard against an accidental fall. Knowing Ned’s ability to climb the route, was with a level of skill beyond my comfort level, Scott and I declined but thanked him for his gracious offer. Ned then made a counter offer, inviting us to work with him the next evening, practicing building ice anchors system. To this new proposal, we anxiously agreed. As our well-worn bodies, retired to the cabins small loft, we were soon joined by over a dozen other sleepy mountaineers and winter campers all with very little understanding of the importance of bodily hygiene. In the warmth of my heavy sleeping bag, I was quickly asleep and snoring deeply. It was not until the next morning at breakfast, I realized my throaty reverberations kept several people awake most of the night. The groups breakfast conversation was spent attempting to determine who the offensive snorer was and making them sleep outside the next evening. I remained VERY quiet throughout this exchange, simply pointing a silent finger toward my climbing partner Scott, who later remarked that he thought people were scowling at him during breakfast. I supportively told him he was nuts. That next morning and into early evening, were spent climbing Central gully, continuing on to the Mt. Washington summit and finally descending Lions head trail. As we approached Harvard cabin all was quiet and the chimney showed no fire burning in the stove. We at first believed that perhaps everyone was still out climbing. Upon opening the door, I was surprised to see the cabin was filled with around a dozen people. The look on everyone’s face was deadpan and any conversations were being conducted at barely above a whisper. No food was being cooked on the cabins small stove and everyone appeared to be still wearing their damp clothing. The mood was dismal. When I inquired what had transpired, a young man in the group came over by my side, grabbed my arm, pulled me close and whispered "Ned's dead". Ned’s dead? Ned’s dead?!? My mind raced and I found my inner monologue failing. I uttered, “Ned’s Dead? How?” Further details supplied by the assortment of climbers and rescuers were fuzzy at best and ill stated. There was mention of an ice dam, a fall of close to 1000 feet and a shattered climbing helmet found at the scene. Given the mind set of the crowd, further questioning was pointless, accomplishing little and only been more troubling to the group. I sat on a bench and mutely tried to sort through the limited information. Later that evening, I choked back a bowl of food with little care for what I was eating, only fueling my body because it was a repetitive task that would keep my mind from drifting to thoughts of the tragedy. After eating, I looked up on the shelf and noted Ned's bottle of Jagermeister. I took the bottle down off the shelf, lifted it back to my lips, took a hearty swig and nearly gagged. I opened the door of the cabin and poured a little on the ground. I believe in my distraught state of mind, I was sharing one last drink with Ned and I prayed to have him walk through the door, sit down at the table and tell perhaps one last story. Unfortunately, that was not meant to be and I had to face the facts that Ned was in fact gone. Days later, an article in a local paper shared the details around Ned’s death. The story depicted an account of Ned’s climb up Damnation with another climber named John Brochu. Both men were simul-soloing the route, as they had done many times in the past. They were approximately 1000 feet into the climb, beginning to navigate the final ice bulge 200 feet from the top when the tragedy occurred. John was in the lead followed closely by Ned. As John climbed over the final section of ice, Ned sank his ice axes into the ice bulge to anchor him while John cleared the section. At around 12:30 in the afternoon, his partner planted his left-hand ice axe into the top of the ice bulge and in the process, dislodged a 6 by 10 foot block of ice. Unbeknownst to John, lying just below the surface lurked a giant ice dam (1). What occurred next was catastrophic. Ned fell with the titanic block of ruptured ice, falling approximately 800 feet to almost the bottom of the gully. John at the same time, was forcibly ejected and “barn-doored” on his right hand ice axe and right foot crampon, only narrowly escaping a fatal fall. From his position, John watched Ned fall down the gully. The entire event occurred with such speed Ned had virtually no time to react. John now realizing that Ned could still be alive and in need of immediate medical attention, continued up the remainder of Damnation gully, as descent at that point would have been almost impossible. Topping out of the climb, he raced south around the rim of Huntington ravine to the nearest down climbable gully, Central, descending it to come to Ned’s aid. Though we were climbing Central Gully earlier in the day, John was down climbing the route, on his way to Ned, well after we had already topped out and were on our way to Mt. Washington’s summit. Upon arriving, John was met by several other climbers already on the scene. A snowboarder rode the half-mile to Harvard cabin, where he was able to use the radio to call Forest service snow rangers for assistance. Climbers on the scene obtained a rescue litter from the Dow First Aid Cache and were placing an anchor system to lower the litter down the steep terrain, when snow rangers arrived. I took four difficult hours and three belays to get Ned to the floor of the ravine. In the fall, Ned had suffered multiple trauma and an open head injury. He was unconscious and having difficulty breathing. Nearby on the snow, shattered into several pieces was his climbing helmet, likely the only reason he had even initially survived the fall. Ned was quickly loaded onto the forest service snowcat and taken down the mountain. An ambulance met the snowcat in the Pinkham Notch parking lot at 3:30 PM and transported him to Memorial Hospital in North Conway, where he died from his injuries. What many fail to consider is that mountaineering is a risk filled pursuit with many hazards, some of which are able to be overcome and some that are not. Risk management and mitigating hazards must be a constant endeavor BUT even then, accidents in the mountains occur due to unforeseen forces. I saw Ned and John's climb, much like riding a motorcycle without a helmet, sometimes you just need to ride the open road with the air whipping through your hair. Sure it is much more risky to ride not wearing a helmet, but some experiences are worth the risk. Climbing without roped protection will always be viewed by some as foolish endeavor. For others, it will be seen as a personal choice, a way to reconnect with the mountain and focusing your entire mental and physical being on a singular task. At that moment of complete concentration, the world seems to slow and you are precariously aware of your fragility when climbing mountains. President's Day weekend of 2002 Scott and I were back on Mt. Washington climbing and staying at Harvard Cabin. During that evening, we were fortunate to meet Ned's mom Clare Green, who was visiting the cabin on the anniversary of her son's death. Scott and I were the only cabin patrons who had stayed at the cabin the previous year. We exchanged with Clare a few stories of our brief encounter with her son and how he had been a popular and a well liked cabin keeper and friend. Clare like Ned was a gregarious soul and Scott and I were very happy to have had an opportunity to express our condolences and share our brief experience with Ned. Clare maintains a website www.nedgreen.com and has published a book of Ned's journal writing and poems titled "Cutting A Bond with the Long Trail". She is currently sending me a copy I will be reading and reviewing on my blog. Clare also runs a scholarship in Ned's honor that has been successful in providing thousands of dollars to aspiring mountaineers and outdoorsman over the past decade. (1) Ice dams occur when large pools of ice, sometimes in excess of hundreds of gallons build up behind ice walls caused under conditions of a rapid temperature drop. The low temperature on the summit of Mount Washington in the previous 24 hours was –19 degrees F. Waterfall ice is formed when water flows over steep terrain in winter. The water that forms the ice is always flowing and constantly forming new ice. When the air temperature drops, water channels freeze up and water begins to pool up behind the ice. This creates hydraulic pressure behind the ice. When the ice dam is disturbed, the pooled water breaks out, often with an explosive force.Ice dams are unpredictable, practically undetectable and once ruptured they can burst forth with deadly results. Evidence suggests the intrusion of John’s ice pick had created a small fracture in the mammoth sheet of ice releasing the incredible hydraulic power of a massive ice dam. So sad. I remember Toby and Brian talking about this after it happened and, as you know, both are avid climbers and love that area. Scary stuff. Erin, That entire area is beautiful but can easily turn deadly. I remember a time climbing where the day started with melting snow and ice and finished well below zero. We were both drenched and racing to keep moving and warm. Then rapidly descending Escape Hatch, I snagged my crampon on my pant leg and narrowly escaped a head first fall. Yikes!! What a fantastic tribute! It is simply beautiful. Amazing story and well told. DEM and Trey, Thanks guys much appreciated. FEBABUCERY in less than a month! My apologies good man, it should have stated, "I'm still wondering why you can't share..." No doubt on the big show, I've got a tripod and camera ready for some serious ice fishing action... Maybe even a video documentary, eh? Great, now why do I get this feeling that by the end of the weekend all you will have logged on that camera is me rolling around in the dark making cat noises . . . (yes, commenters that be an inside joke)! I trust you got my e-mail on island falls and the pike tourney!! Febachery awaits!! !